Remember the days of the Metal Gear Solid 4 hype train? Every year around E3, unfounded rumors would begin popping out of nowhere which stated the game would follow other high profile PS3 exclusives, like Final Fantasy XIII, and make its way over the Xbox 360. Well, that never happened, and it won't with the Metal Gear Solid: Legacy Collection either. The latest bundle of Konami's flagship series was announced last week as a PlayStation 3 exclusive, and Xbox 360 fans got their hopes up yet again that the box would be making its way over to their console too. 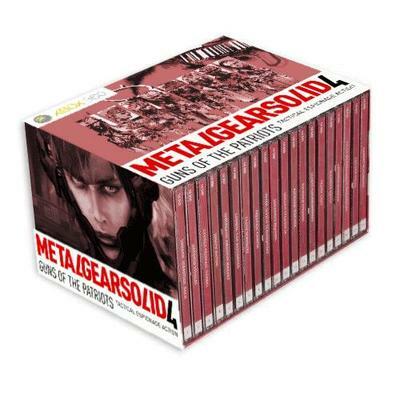 The bundle includes every game included in the series main timeline, including the elusive Metal Gear Solid 4: Guns of the Patriots. However, Hideo Kojima has confirmed on his Mogren Radio show that the box definitely will not be coming to the Xbox 360. "I'm sorry to say an Xbox 360 version isn't being released, because an Xbox 360 version of Metal Gear Solid 4 hasn't gone on sale. To explain the situation, the amount of data in MGS4 is just too enormous. I want to put The Legacy Collection out for Xbox 360. But we won't be releasing it." The Metal Gear Solid: Legacy Collection will only be available using Blu-ray discs and will hold seven games. The data in Metal Gear Solid 4 alone is enough to fill seven Xbox 360 DVDs. The only hope Kojima offered would be a port on the next generation Xbox console. So once again, the rumors of Metal Gear Solid 4 on the Xbox 360 are falling short, but it's a little strange that rumors alone can conjure up such nostalgia. This has to be one of the most recurring rumors in video game history. The Metal Gear Solid: Legacy Collection will be released next month on the PlayStation 3 in America. Xbox 360 fans can enjoy the marvelous Metal Gear Solid HD Collection and Metal Gear Rising: Revengance without having to buy a new console.